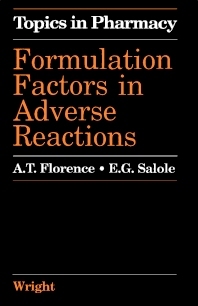 Topics in Pharmacy, Volume 1: Formulation Factors in Adverse Reactions focuses on the important aspect of drug therapy—the nature of the dosage form or its ingredients that adversely influence therapeutic outcome. This book discusses the adverse reactions to formulation excipients, immunological basis of allergic reactions to drugs, and adverse reactions to parenteral medication. The influence of the shape and size of solid medicines on esophageal transit, and effects of the physical characteristics of formulations on adverse reactions are also deliberated. This volume is intended for senior undergraduate and postgraduate students in pharmacy, medicine, nursing and allied health sciences, and practitioners in the field of drug therapy.